Part I of this series described some the psychological benefits of training in the Japanese martial art of Aikido. This article will focus on the relationship between Aikido and the practice of mindfulness. Mindfulness practice as an intervention to promote mental health pervades our field these days. These meditative practices train the ability not only to be present in the moment but also to recognize a distracting thought, identify it non-judgmentally, and then return to the present moment. This process is ingrained only by hundreds or thousands of repetitions over a long time period. Aikido is a mindfulness training process. Like mindfulness meditation, Aikido practice requires purposeful concentration on every element of a technique to “get it right,” especially during the first few hundred repetitions. An early-stage student, or an experienced practitioner trying to learn an unfamiliar technique, will often have distracting thoughts that take attention away from performing it. This is not unlike the novice meditator who finds it difficult to stay focused on the meditation process. But over time and repetitive practice, both the meditator and the Aikido practitioner gain the ability to maintain their focus for longer periods. Practicing mindfulness in the martial context adds the intensifying element of maintaining physical safety for both partners, which may accelerate the acquisition of mindfulness skills. In addition to training in empty-handed forms of Aikido, we also train with traditional weapons, such as the jo (wooden staff), bokken (wooden sword) and tanto (wooden knife). This type of training further intensifies the reality of the attack and, thus, increases the need to maintain focus. When a hard oak stick is coming at you, it gets your attention. 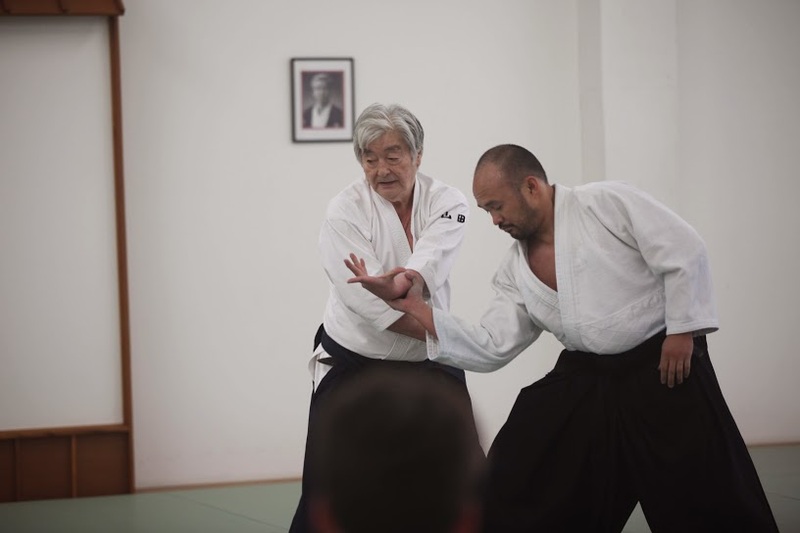 Like the highly experienced meditator, the long-time Aikido practitioner gets into the “flow” of the technique with little conscious effort – the so-called “no-mind response” in martial arts. This is the application of mindfulness in practice. Aikido training is comprised primarily of practicing with a partner, with one partner in the role of the “attacker” and the other the “defender.” They typically alternate roles after four repetitions. As the defender performs a technique against an attack, the attacker takes the fall, which is a skill-set known as ukemi (i.e., taking the fall). There are about eight different types of falls that are basic for early-stage training, with many different variations as students progress to higher levels. Learning to perform ukemi at even a basic level – allowing yourself to tumble head over heels in response to a defensive technique – is often more challenging than performing defensive maneuvers. I describe to our students the challenge of ukemi as: follow the forces in a way that you maintain as much balance and body control as possible – while your partner is trying hard to unbalance you – WITHOUT RESISTING. Learning ukemi requires courage to progress to higher levels and trust in one’s instructor and partners to keep you from being injured. From the psychological perspective, the practice of ukemi in Aikido is about developing resilience. The early-stage Aikido student with significant meditation experience, whose quote leads off this article, describes ukemi as being “. . . in absolute alignment with meditation, as it is not about resisting the fall, believing you will never fall or even being opposed to falling, but rather about learning the art of taking the fall.” In the same essay he writes that Aikido is about developing “an individual who can survive anything that comes his/her way.” This is practically a definition of psychological resilience. As with the role of performing a defensive technique, practicing ukemi requires a high level of moment-by-moment focus, especially as this role has a greater vulnerability for injury. Thus, both roles in Aikido practice contain elements closely analogous to mindfulness meditation training. Aikido training is certainly not for everyone, as it requires a desire to engage in a vigorous physical activity and to enjoy the challenge of learning non-intuitive martial art. But for those who meet these criteria, consistent Aikido practice plays a positive role in psychological development in addition to the development of physical skills and stamina. Aikido as mindfulness in motion certainly contributes to this developmental process.